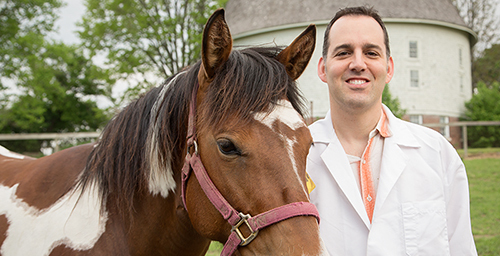 Stuart C. Clark-Price, a specialist in anesthesiology and pain management in the U. of I. Veterinary Teaching Hospital, is leading a multiuniversity research project aimed at developing treatment protocols that help horses get back on their hooves quickly and safely after surgery. Accelerometers - portable data recorders that capture information on motion, vibration and impact - are frequently affixed to shipping containers when transporting delicate scientific instruments to monitor handling. Smartphone users may be most familiar with accelerometers as the sensors in their phones that enable users to reorient their phone's displays from vertical to horizontal. Scholars at Illinois and several other U.S. veterinary schools are using accelerometers to monitor horses' movements as they awaken from anesthesia and to develop protocols that minimize risks of injury. Stuart C. Clark-Price, a specialist in anesthesiology and pain management at the Veterinary Teaching Hospital at the U. of I., is the lead investigator on the research. Veterinarians at Cornell University, the universities of Florida, Georgia and Tennessee, and Virginia Tech are collaborating on the project. Horses' size, strength and anatomical structure make them challenging surgical patients. "General anesthesia poses greater risk to horses than any other domestic species," Clark-Price said. "The mortality rate in horses is about 1 percent, whereas in humans it's about .001 percent and .05 percent in dogs and cats. There's this magic period - three to 3 ½ hours - and if anesthesia lasts longer than that, their risk of complications at recovery starts to skyrocket exponentially. Limiting their time under anesthesia is really critical. And immediately after they wake up, they have to stand up." If horses lie for extended periods of time, their body weight can crush blood vessels, cutting off blood flow to their muscles and causing those muscles to begin to die. If that occurs, horses are unable to stand again when they come out of the anesthesia. When horses are lying on their sides for surgery, their large intestinal tracts can compress their lungs, making it difficult for them to breathe. Horses also are at great risk when they're awakening from general anesthesia because their strong "fight or flight" instinct compels them to stand up right away even though they may be disoriented, weak and ataxic, or imbalanced. About 1 percent of horses sustain serious injuries, such as skull or leg fractures, during falls that occur while they're awakening from anesthesia, Clark-Price said. In Clark-Price's research project, he and his colleagues attach tri-axis accelerometers to surcingles that wrap around the horses' chests and hold the devices in place over their withers, which are on horse's backs between their shoulder blades. As the horses awaken from anesthesia and attempt to stand up, their movements are recorded by the device. The data are later uploaded to a computer and compared to a statistical model that rates each horse's recovery on a 0-100 scale, based upon the amount of difficulty the horse had getting up. "If a horse stands up nice and slow and controlled, it triggers the device less, but if the horse gets up and ricochets around and is flailing all over, the device is triggered more," Clark-Price said. "The smoother, slower and quieter a horse stands up, the less likely they are to be injured, and they get a better score. A perfect score is 11. The worst possible would be 100." Until now, veterinarians evaluated equine patients' recoveries by viewing videotapes of the horses and assigning scores, but that method can be subjective and arbitrary, Clark-Price said. Using accelerometers and the statistical model "takes the human element out of it altogether," Clark-Price said. "It's a completely objective way of gathering data on their recovery." Clark-Price also is exploring the use of short-acting medications to calm or sedate horses until inhalant anesthesia wears off, so that horses are more alert and coordinated when they attempt to stand up. "One drug that has a lot of promise at smoothing out horses' recoveries is propofol," a short-acting hypnotic agent used to induce or maintain anesthesia in humans and which singer Michael Jackson reportedly abused as a sleep-agent, Clark-Price said. "There are some other sedatives and anti-anxiety drugs that are similar to the drugs used on humans that also calm horses so they don't go into this 'fight or flight' mode, and that let horses eliminate the remainder of the gas anesthesia so they stand up with more coordination," Clark-Price said. Depending upon a number of variables, including the age and condition of the horse and the length of time it was anesthetized, hospital staff may perform assisted recovery, confining patients in padded stalls, in hydropools or on rapidly inflating/deflating air pillow systems to prevent injury and complications. Medical staff also may use ropes, slings or lift devices such as tilt tables to help horses move to standing positions when they awaken. Clark-Price discussed the challenges of equine anesthesia and assisted recovery in an article published in the April issue of the journal Veterinary Clinics of North America: Equine Practice. The article is available online: http://www.sciencedirect.com/science/journal/07490739. Clark-Price has completed two studies on his research, which he presented as abstracts at the 2012 annual meeting of the American College of Veterinary Anesthesia and Analgesia last fall and which he plans to submit to veterinary journals.